The 2016 ultimate guide to Governors Island, which reopens for this summer this Saturday! 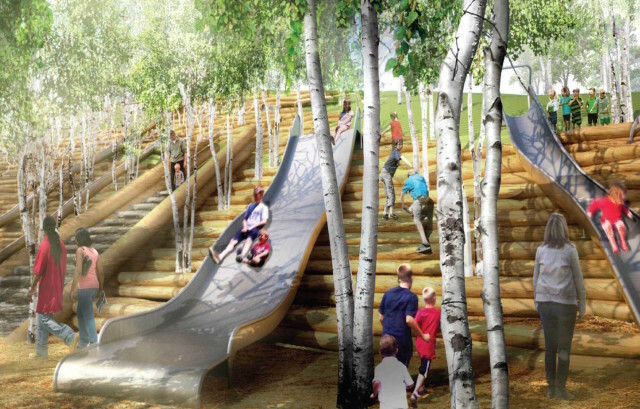 Slide Hill will be part of The Hills when it opens in July and will include the city’s longest slide. Rendering via website. 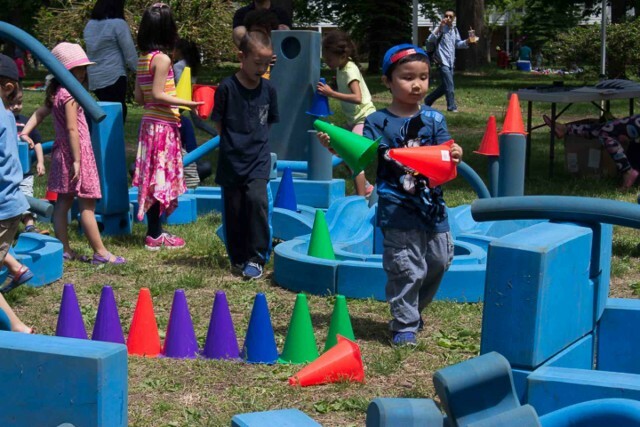 While the weather is having a hard time coming around to it, the opening of Governors Island (spelled without the ‘s) on Saturday (May 28) is the definite sign that summer is on its way. 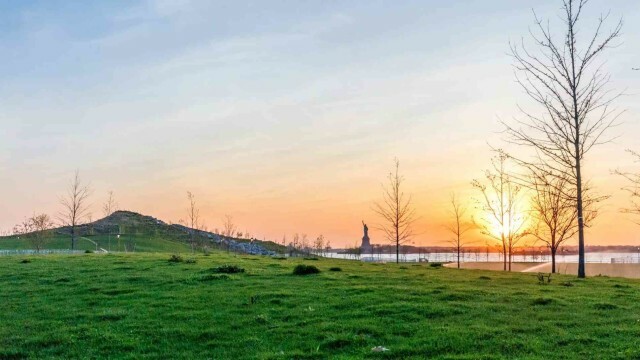 The sprout of land between Manhattan and Brooklyn has been undergoing enormous renovations that will include giant, sloping hills rising as high as 80 feet and a slide park that has NYC’s longest slide (57 feet!). And while you wait in the inevitable slide line, you can marvel at the spectacular views new and old. The designs were put in place by Dutch design firm, West 8, and echoes back to the 1600s when the island (really just a glorified rock then) was “discovered” by a boat full of Dutch people. The native Americans they “discovered” it from called it Paggank, or “nut island,” for its plentiful nut trees. The name changed to Governors Island for all the British Governors that stayed there in the coming years. Several wars later, the name did not change. And only in the early 2000s did Governors Island open to the public. But enough about history. The time is now! Well, actually, the time is May 28, when the island will reopen to a flood of visitors like you, wondering if alcohol and slides is as good an idea as it sounds. Plus, you can grill on the island for the first time! The ferry is fast and cheap! Via Governors Island website. 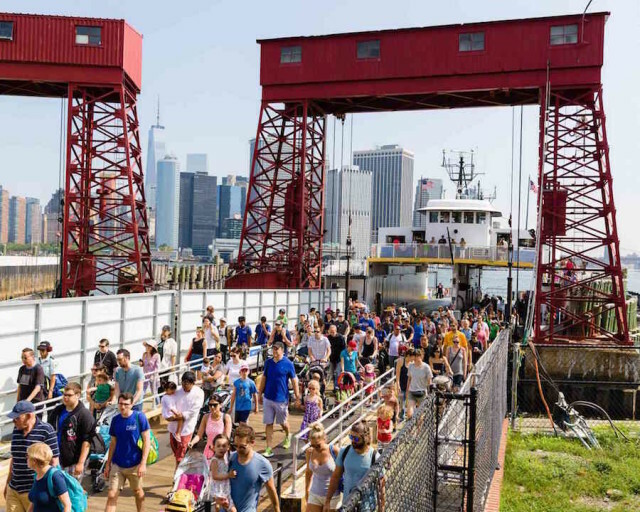 Residents of Brooklyn can cross the Buttermilk channel to the island every weekend day on the ferry from Brooklyn’s Pier 6 as early as 11am, and leave the island by 7:30pm. Manhattanites have the luxury of daily accessibility to the island from the Battery Maritime Building just to the left of the Staten Island Ferry station. Cost is $2 or $1 for seniors. Holders of an NYC ID get to go for free, as does anyone who is (or looks) 13 years old or younger. The Hills will offer 360-degree views of the island. 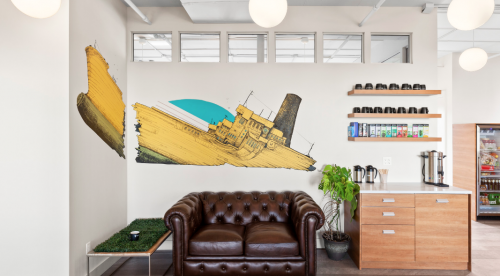 Photo by Max Touhey for Curbed NY. The Hills: A new section of the island called The Hills is opening July 19. Designed by landscape architects West 8, the HIlls rises 25-75 feet above the harbor, offering lush rolling landscapes, grassy overlooks, slides, 360-degree views and a permanent installation by British artist Rachel Whiteread. The hills contains sub-hill sections, including Slide Hill, home to that 57-foot-long slide. Get it, grill: You can grill on Governors Island for the first time! The island has six new grills you can reserve in advance here. Watch an eerily silent video of all the added features here. 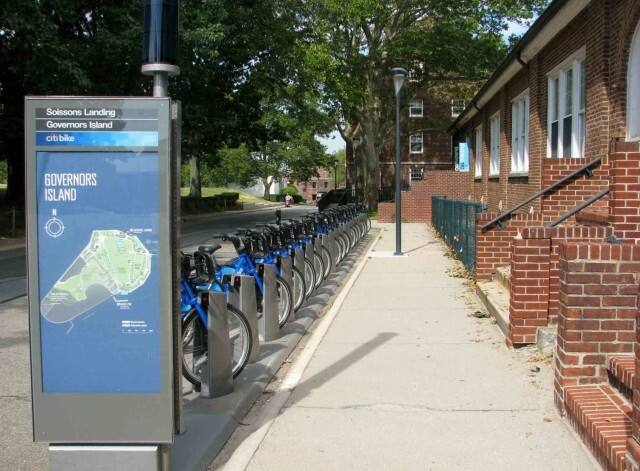 Bring a bike, rent one or hop on a Citibike at Governors Island this year. Drinking: Wait, so, can you get drunk? Yeah, but only in designated areas and with alcohol purchased on the island. Don’t bring your own booze (unless you’re really keen). Other prohibited items: cigarettes, non-service dogs, weapons (sorry, LARPers), and motorized vehicles. Biking: You can bring your bike on the ferry and, as of 2015, Citi bike docking stations have been added to the island! You can also bring your own bike or rent from Blazing Saddles. Fishing: Catch and release fishing is also allowed (how to get your fishing license). While it’s discouraging that you cannot filet an East River trout and make sushi in the park, picnics are more than welcome. Food: Governors Island offers “food at a variety of price and taste points” at the two food courts on the island. The Liggett Terrace Food Court provides a truly legit selection of food and is open every day of the week. The King Ave. Food Court is open on weekends only. The food offerings include Blue Marble ice cream, vegan ice cream from Alchemy Creamery, El Paso Taco, Wafels & Dinges, Little Eva’s beer garden and much more. Arts and Leisure: Want to see some fancy art while you picnic and bike? Check out Visitors, “an exhibition of public interventions.” Art enthusiasts and confused tourists will be able to enjoy the art all season long. Governors Island, in collaboration with Art Kibbutz, will host open studios for artists of all types. If you are interested in escaping the buzz of the city to hone your craft, you can apply for a residency here. Meditation classes will be available, as well as dysfunctional theater and opportunities to write all over the wall of a house. 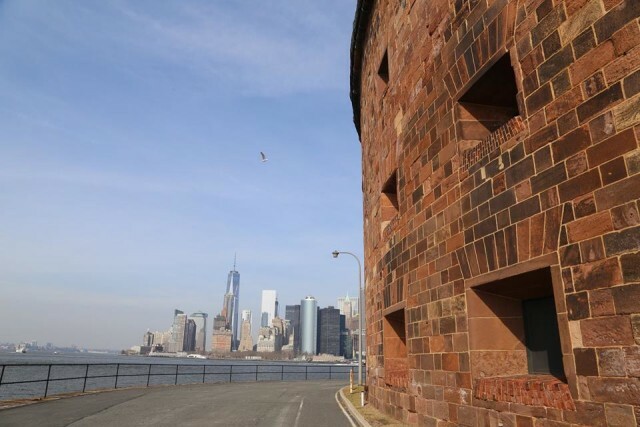 You can check out all of Governors Island’s summer-long exhibitions here. It’s only a short ferry ride from Manhattan but sites like Castle Williams really make Governors Island feel a world away. Via National Parks Service Facebook. And while you’re not drinking your secret booze, picnicking and biking all along the greenery of Govs Island, you will also have opportunities to play soccer (with a permit) or putt-putt golf, climb a tree house, learn how to compost, explore Castle Williams, and learn why Fort Jay is huge star. Family Fun day in action on the island. Via website. As always, Governors Island has some of the most famous events in NYC. (Just to clarify: Governors Ball is not on Governors Island, dummy. 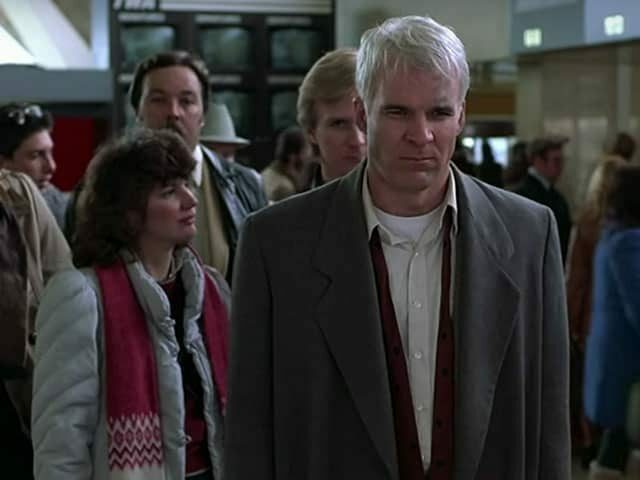 That’s Randall’s Island, and plus, you don’t wanna go there, anyway.) And as always, there’s far more to do than what we’re putting in here, but this list of our top picks still ought to give you enough to keep busy all summer long. 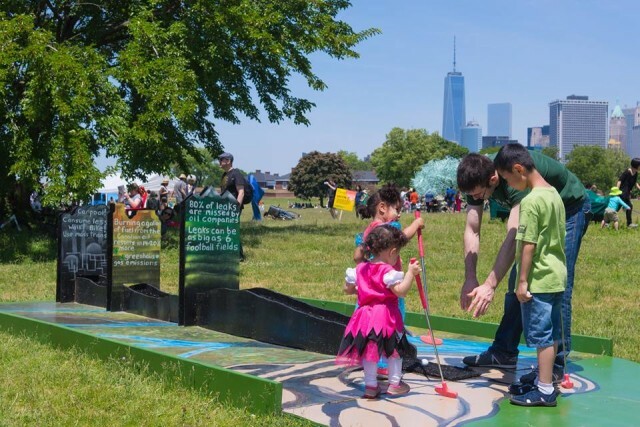 Kicking off the opening of Governors Island will be Family Fun Day on May 29, replete with kid-friendly pirates, grammy-winning Tim Kubart, clowns, puppets, magicians and the Billion Oyster Project. If you’re feeling too adult for Family Fun Day, you can enjoy the fine musical stylings of the Parker Quartet on the same day from 1pm to 5pm. Minigolf, art and much more can be found during the Figment festival. Via Figment NYC Facebook. From June 3-5, check out Figment NYC, “an explosion of creative energy.” Figment encourages visitors of Govs Island to participate in an on-going art project. Past events have featured oodles of pool toys, bouquets of umbrellas, and this guy. On June 4, take a break from the art and get a workout at OutdoorFest Warm-Up. The free event includes a group run, workout, yoga (BYO mat) and a motivation, inspiration and optimism writing class with Jane Rosales, the fitness blogger and legal mind behind the popular NYC blog Run the Jungle (bring a notebook & pen!). Jazz Age Lawn Party is always a hot time. Via Facebook. 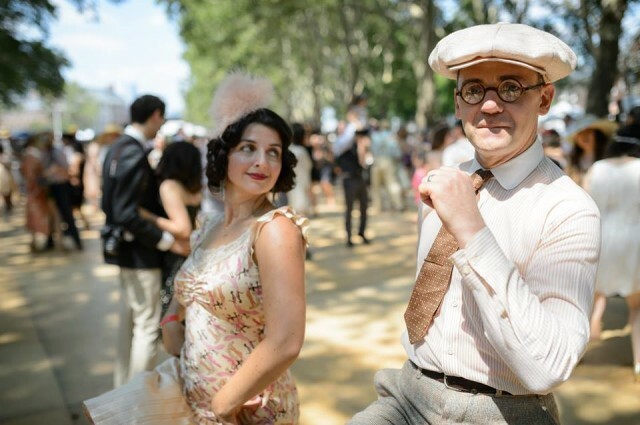 Of course you can dress up like Zelda Fitzgerald and go to the Jazz Age Lawn Party from June 11-12 or Aug 13-14. It’s pricey, so for the more frugal flappers, you might have to substitute the big band orchestra for a jug and washboard at the Porch Stomp on June 18. This americana, bluegrass, and roots revival is not only free, but totally inclusive–if you have an instrument to play, go ahead and join in. Classical musicians will be playing May 29, June 25, July 23 and Aug 27. And if none of those outlets suit you, you can pull a 180 on headbang at this year’s Punk Island on June 19, where you can feel the rage of Argentinian punk band, I.R.A (Infexion Respiratoria Aguda), and many more bands including Freya Wilcox, Thundera, Bitchtits and others. Badminton players getting ready for the festival. 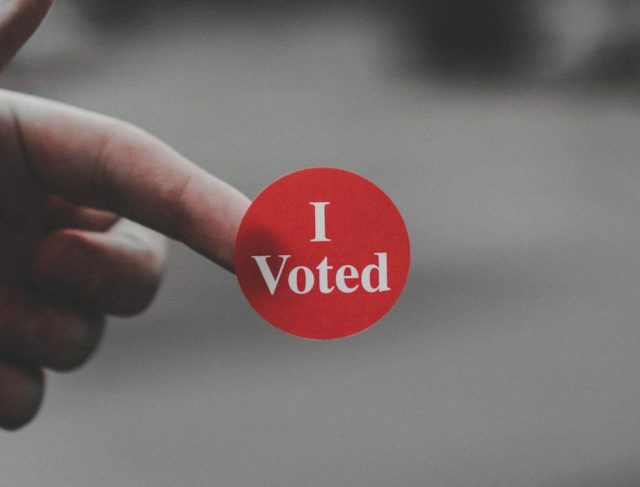 Via recessnewyork.com. 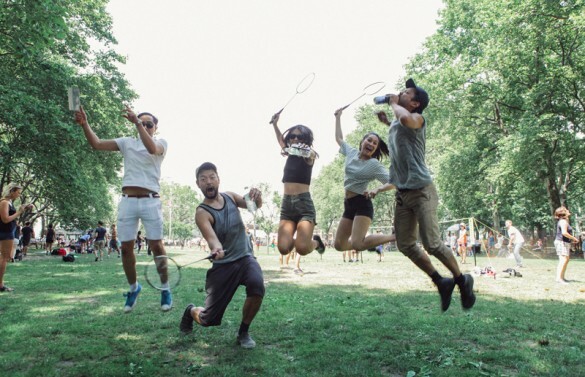 There’s a Badminton tournament on June 18, a birder festival, vintage baseball on July 16, and the 6th annual unicycle festival from Sept. 3-4. Last up, for all you folks feeling in the pink, there’s a rosé-themed picnic July 9-10, accompanied with DJ sets and enough rosé-enthusiasts to make you wonder how you’ve been missing out on the cult for this long. Feel free to express yourself at the Governors Island’s Poetry festival, July 30 – July 31. What will make this stand out from a normal poetry reading? Answer: sunlight. The line-up includes Apogee Journal, Brooklyn Poets, and the Emily Dickinson Museum, among others. Oh, and there is something called the poetry brothel.